It must be evidence of the increasing taste of the disc-buying public that we seem to be getting more and more classic titles appearing on DVD and Blu-Ray, handsomely produced to appeal to the general cineaste as well as to the silent film specialist. And these are not just the obvious, every-good-home-should-have-one titles, but a range of titles that extends the available canon and increases the chance of discovery for those maybe investigating silents for the first time. 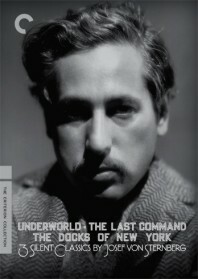 All of which is preamble to the news that Criterion is to release a collector’s set of three classic titles directed by Josef von Sternberg: Underworld (1927), The Last Command (1928) and The Docks of New York (1928). Von Sternberg is known to most film buffs for the exotic films he made in the 1930s with Marlene Dietrich, such as Shanghai Express and Morocco. His silent American films are more cited than seen, so there appearance of these three titles for the first time on DVD will give many the chance to see for the first time how von Sternberg’s brooding, rich visions were established in the 1920s and what continuity there is between the silent and sound era director. Underworld is the archetypal gangster film, The Last Command is a Russian Revolution drama for which Emil Jannings won the first-ever Academy Award for best actor, and The Docks of New York is a fog-bound, intense human drama of waterfront life in the kind of storytelling that silent film does better than another other medium. The films each come with two scores: one by Robert Israel for each film; two by the Alloy Orchestra, for Underworld and The Last Command; and a piano and voice piece by Donald Sosin for The Docks of New York. The extras include two ‘visual essays’ by Janet Bergstrom and Tag Gallagher, a 1968 Swedish television interview with von Sternberg, a ninety-six-page booklet, the original film treatment for Underworld by Ben Hecht; and an excerpt from Sternberg’s autobiography, Fun in a Chinese Laundry, on Emil Jannings. The box set will be available from Criterion on 24 August. And if that wasn’t enough, Flicker Alley has announced a 2-DVD set of Chicago (1927), based like the recent musical on Maurine Watkins’ gleefully cynical 1926 play. The film was directed by Frank Urson, though it is generally understood to be mostly the work of Cecil B. De Mille (he declined to take a credit because such a tale of low life didn’t really fit in with his King of Kings image – the made both films in the same year). It has become established as a festival favourite since its recent restoration. It stars Phyllis Haver as Roxie Hart and Robert Edeson and Billy Flynn. The music on the DVD is supplied by Mont Alto Motion Picture Orchestra (listen to some extracts here). The extras include The Golden Twenties (1950), a compilation documentary feature produced by The March of Time; a documentary The Flapper Story (1985); a brochure by Thomas Pauly on author Maurine Watkins and the factual background to Chicago, notes by Robert S. Birchard, and a documentary supplement, Chicago; The Real-Life Roxie Hart by Jeffery Masino and Silas Lesnick. Chicago will be released on 6 July. I would love to get hold of a copy of the Sternberg set. It’s just a shame they are rather expensive AND on top of that, we have to pay customs on top of that. Yes, but think of all the money it cost to produce the three films originally, all the great talents involved, then the costs of caring for the films and their restoration, then the high def transfers, then licensing costs, then the music, then the immaculate packaging in the best Criterion style – add all that together, and $63.96 (from the Criterion store) looks like a snip. I agree…..yes, the price will be on the steep side, but there are very few silents that I’ve seen that can match this trio, actually, make that films of any era. So glad they’re finally getting a release. Score for “Chicago” great. Should erase memories of Patti Plinko but not The Prima Vista Social Club heard live.